One of the best ways to defeat Adultitis is to set booby traps for it. An Adultitis Booby Trap is a simple item or routine you incorporate into your life for the purpose of serindipitously reminding yourself to smile, laugh, or take yourself lightly, particularly when Adultitis levels are at their highest. 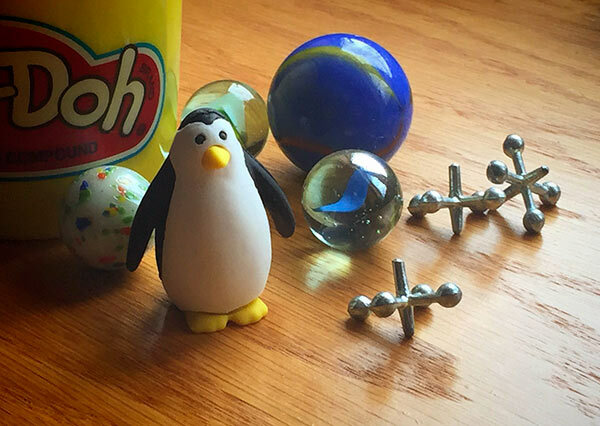 Our favorite Adultitis Booby Trap involves a tiny penguin eraser called Marty. For many years, we used Gumby’s friend Pokey until we stumbled upon Marty, who reminded us of the hero on the cover of my book), and has since become a champion of dreaming big, ignoring common knowledge, and not waiting for permission. Almost anything can work, but the best candidates are small and waterproof. The game is a bit like Hide & Seek, except instead of hiding and finding each other, you hide Marty. One person starts out with the task of hiding Marty in a place someone else will eventually find it. The person who finds Marty is then in charge of hiding him again, as the game continues indefinitely. The fun comes when you’re pouring yourself a bowl of cereal, taking a shower, or making copies, and Marty shows up unexpectedly, bringing with him a smile to brighten your day. See? An Adultitis Booby Trap. This game rocks because it’s a super simple way to add a bit of playfulness at home or work. Kim and I started this game when we were dating after getting the idea from some college friends. Our friend Eliz plays this game with her mom, hiding a ceramic hen in each other’s houses. We were sitting at her dining room table one night for dinner and she started laughing hysterically. She had not noticed until just then that the hen was in her china cabinet. Her sneaky mom had put it there over a week before. So fun! It’s all about adding more fun to your daily routine, easily and inexpensively. And don’t let the simplicity of this game cause you to underestimate its effectiveness. We have received countless reports in the last decade from people all over the world who have been stressing less and having more fun…all because of a “silly” game. If you decide to adopt Marty yourself, you can pick one up here. Happy hiding!